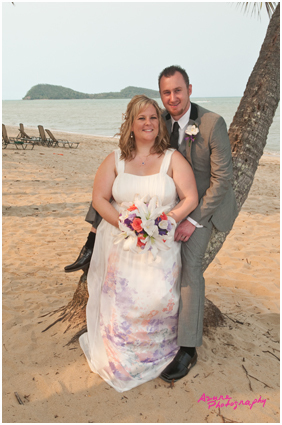 Palm Cove is a perfect location for beach side weddings. 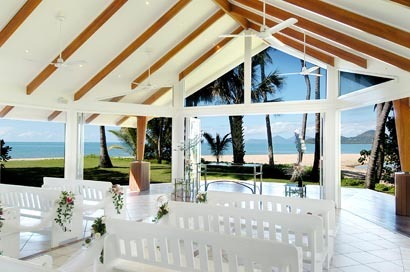 As well as the beach, the Wedding Chapel is a popular choice. Palm Cove Tropic Apartments is just across the road from the Chapel, a short walk to Sea Temple (another popular wedding location) and a 2 minute walk to the beach and Williams Esplanade. We offer comfortable 4 diamond rated apartments at an affordable rates. We are a great alternative to the 5 star resorts and their 5 star prices. Our covered BBQ area is a favourite place for family get togethers. We have a Day Spa on-site to help with the last minute touches or a relaxing massage. Book Now or Contact Us and we can help find you affordable accommodation in the heart of Palm Cove. Palm Cove on the Beach is located at 139 Williams Esplanade. This 3 bedroom unit features 3 bathrooms and 3 spas. 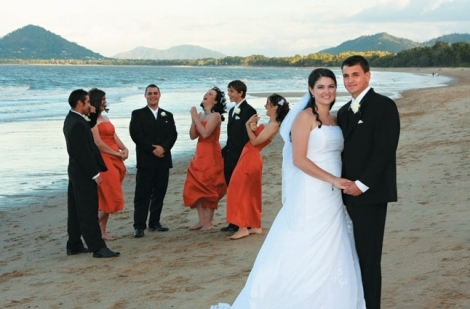 It has views of the beach and Coral Sea and just across from the Palm Cove Jetty. Ideal for larger families and groups.